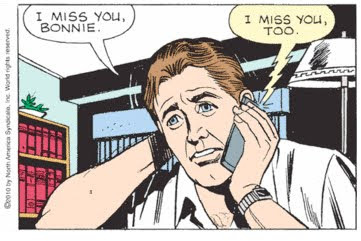 While Bonnie's therapy has put her on the joy side of life's continuum, Ernie has been sapped of all color and light and is left the living embodiment of Bonnie's former empty void. Two Beatles songs in one week! First, "Doctor Robert," and now "A Little Help From My Friends." How awesome is this? You'll want to click on the image above to see a larger version. So, how did I come about this strip? Faithful reader "phoebes from santa fe" sent it to me. In a box. With dozens and dozens of other strips from 1949 to the mid 1950's. I was stunned. Thank you so much phoebes. I think you must be the kind of friend John Lennon AND Paul McCartney were writing about (and Ringo Starr was singing about). You are one in a million! I guess we can now stop calling her Bonnie? Bonnie Johnson?, and call her bonny Bonnie Johnson instead. Like Aldo Kelrast, Vera Shields, Ted Confey, and Doctor Good, bonny Bonnie Johnson now has a name that is so obvious even she can fit in at Charterstone. It's all just so marvelous. Two weeks of grueling recovery work and all is well. 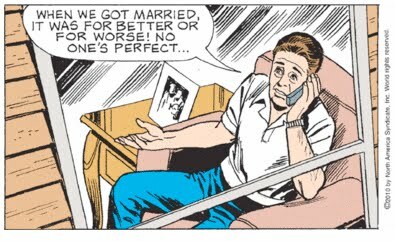 Think of the marriages that could be saved if Mary Worth would just help people sort through their boxes, or pour out their alcohol, or filter their computers, or fill their refrigerators with produce instead of pizzas. All it takes is a little intervention. 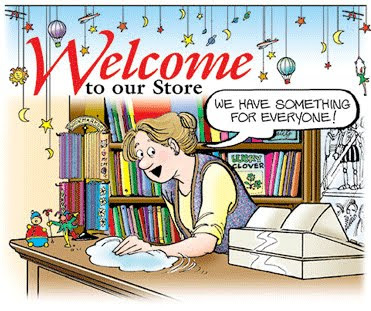 . .
For more information on how easy it is to treat compulsive shopping disorder, click here. For Better or For Worse? That makes me want to buy books! I just hope they have something for me. 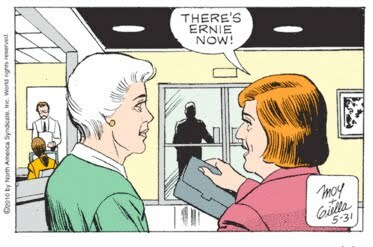 Based on the number of books on that book shelf, I'm concerned that Ernie's not staying in a hotel on business, but that his regularly occurring month long trips are nothing more than visits to his second family. Ironically, his other wife is a penny pinching miser, and Ernie has never been able to decide which family he loves more. Jeff's short term memory loss is fine over salmon squares at the Bum Boat, but in surgery, when removing a kidney, the results are generally tragic. Mary: "I hope her recovery will go beyond just her marriage and she'll be transformed into a super cyborg with one thousand arms. Think of how quickly she'll be able to clean up her living room!" Another thing couples argue about is who gets to wear the chin napkin. 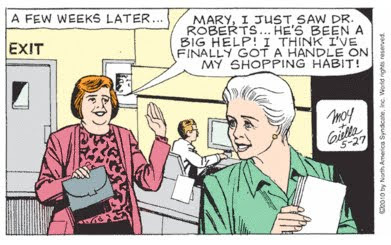 But in a remarkable display of magnanimity, Mary Worth has relinquished the privilege to Jeff. 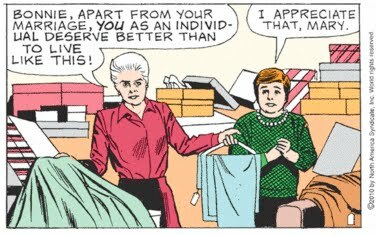 Thankfully, Mary Worth is always available to tell you when you have gotten into a bad living situation without realizing it. Speaking of getting into a bad situation without realizing it, did Mary realize her large intestine would be so overcooked? Jeff: "Waiter, I'll have three salmon squares with a side of cheese puffs and the chef's best cat vomit. And a martini for my lady friend. Did you know, I won the Master's Tournament in 1978?" It's just another typical night out in Santa Royale. Oh, Mary, you just can't help yourself can you. Actually, I don't have much to say about this strip; it's just that it has been so long since we've enjoyed a good meal at the Bum Boat, that I needed to post an entry for old time's sake. So many memories. Oh, and look, they've got a new menu, with a drawing of some sort of boat on it I think. Very nice. But I wish they hadn't removed the appetizers; they used to serve the very best spinach-artichoke dip. Telephone gossip is such an important part of Mary's life that she's even built a telephone pulpit from which to sermonize her scuttlebutt. This blog has been a lot of fun for me. And I hope it has been fun for you too. Here's to another 750 posts. To see more of why Bonnie is feeling so great, click here. If I understand Bonnie correctly, Mary, she's suggesting that she can handle this on her own, and that she really doesn't need your help. She is definitely not asking for you to put her under your voodoo spell. Thank you, Scott, for another awesome banner! 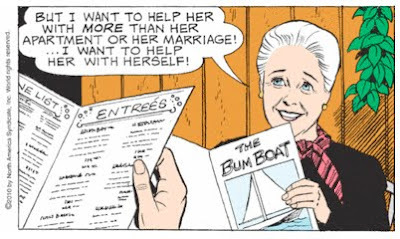 Mary Worth may be "there" for Bonnie, to help her sort out the mess she calls life, and the mess she calls home, but she isn't such a great listener. In today's entire Sunday strip, all Bonnie manages to squeak out is a desperate, "Mary..." Perhaps she was trying to tell Mary that she's repeating herself terribly. I don't think I want to know all of Bonnie's bad habits, but cross dressing is clearly one of them. And I know a fashion counselor whom Bonnie and Ernie can talk to. Er... with whom they may speak. If you're like me, you thought of one person when you heard the word "counselor." Terry Bryson. Ensign Terry Bryson. It's funny how time dulls the senses. When the image of Terry Bryson popped into my brain, I was actually kind of excited. I had to pause and think, wait, Terry Bryson was without a doubt, the most painfully pedantic character ever to cross the threshold of the Charterstone Condominium Complex. Four piles. Four different destinies. The sorter shall decide. But who shall presume to sort? 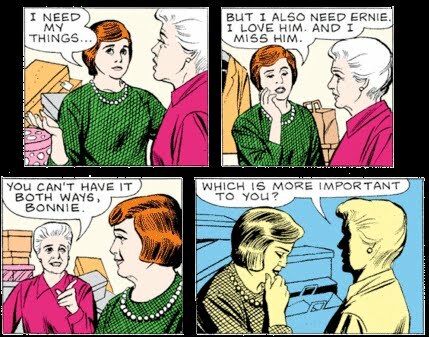 Only Mary Worth, for her decree shall not be overlooked on the Day of Final Sorting. O, what a week of glory this shall be. Let the sorting commence! Mary, I must respectfully disagree. You most certainly can have it both ways. You can have your cake and eat it too. The New York Times and the Wall Street Journal. NPR and FOX News. The Yankees and the Mets. Paper and plastic. You can be both fat AND skinny. Old AND young. Ambiguity is the sugar and spice of life. Mary, get help. Please. Before it is too late. Your problem is as easy to see as a room full of boxes, obvious to everyone but yourself. Of course you want to criticize Bonnie. She lives in a condo full of boxes. Boxes from Maisie's and J.B. Penny. Big boxes, with stripes. You can't help yourself. 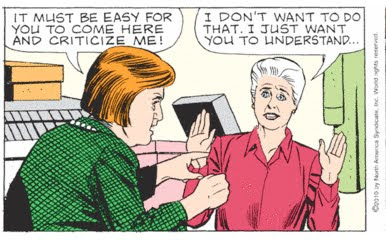 Bonnie is the first person to stand up to Mary Worth since Lynn Griffin told Mary to take a hike. I hope she has better luck at helping Mary change her ways. Well, gee, Mary... Thanks. Now that you put it that way, I've completely lost my compulsive desires. If only other addicts would stop and consider what they might lose if they continue to act out, the world would be free of problems forever. I think Bonnie speaks for the entire Charterstone residency when she says, "Don't judge me, Mary." When I turned myself over to God, I took my life out of the hands of an idiot. When the world comes to an end, it will do so without my permission. Constructive criticism: I tell you what's wrong with you./Destructive criticism: You tell me what is wrong with me. "I don't need your help today.... Love, God." The only thing worse than my problems are my solutions to them. Meddlers Anonymous meets every Monday and Thursday evening at 8 p.m. at the Santa Royale First Methodist Meetinghouse at the intersection of Old Country Road and Ernst Avenue. Wow. Just wow. I'm sitting here in reverent reverie, stewing in the juices of jubilation, as I savor again and again the depth and excitement of Bonnie's story. For those who wish to join me in my exquisite exultation, I am printing Bonnie's story below in its excellent entirety. Let me tell you a story, Mary. When I was growing up, we couldn’t afford nice clothes. I was always envious of other girls who dressed better… It was like that until I married Ernie. 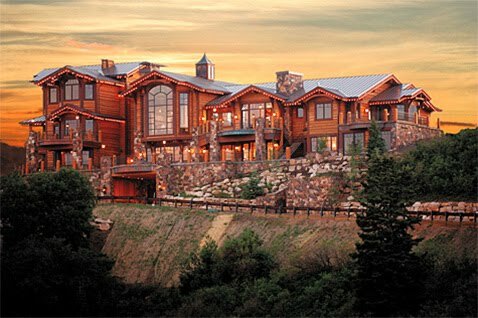 After my marriage I could finally afford to buy what I wanted. And I did. My mother passed away soon afterward and I was devastated! There was … a void. Some voids can never be filled.